Someone on a forum asked me a series of questions about coaching. I thought I’d share the answers with the wider public. What is the extent of time that you devote to coaching per week? … as a club coach, 3hrs at training, 3hrs at the weekend for game prep/game/post match social (double that, or more if it’s an away fixture when travel is factored in). I’m maybe a bit more obsessed than most with planning and keeping things fresh and relevant. I probably think about each session for about a half hour (more when I was younger and didn’t have an internal database I could pull ideas from), and do a lot of reading on sport science, follow coach development people on Twitter, etc. which is immeasurable. When I was a school coach, it was about 2hrs every week day, with at least an extra half hour a day planning, setting up, etc. but school seasons are only three months long. Do you think it detracts from other aspects of your life? … I find providing an enjoyable and enriching atmosphere for athletes incredibly rewarding. I was lucky to have great coaches when I was in school and feel it my duty to give back as I have a deep passion for the game and have developed great coaching ability. I used to love being the driving force behind club and school teams that won a lot, though still kept a good set of principles that wasn’t “win at all costs”. (At my ‘worst’, I specifically recruited good players for a club team and while I didn’t turn anyone away, I certainly didn’t have open invites to all the schools in our area. I did still manage to balance everyone’s playing time fairly.) 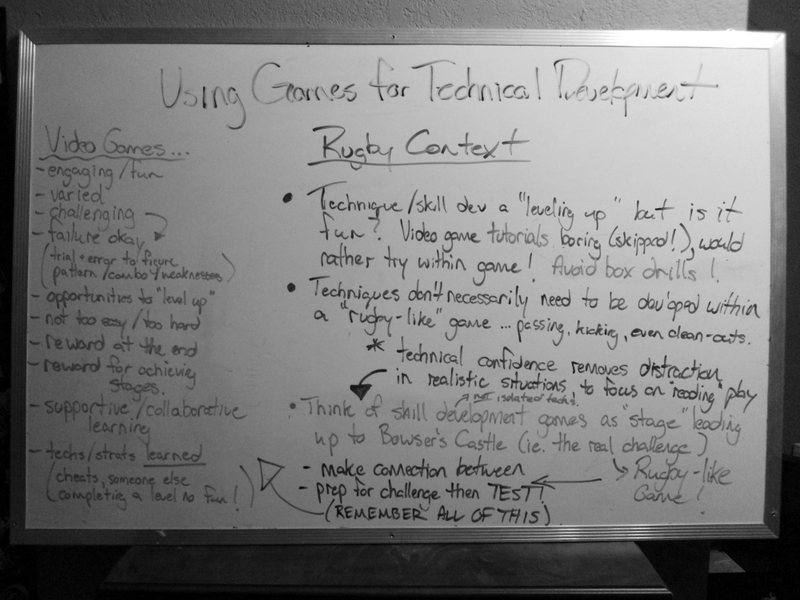 Since reading a lot on athlete-centred coaching, I’ve come around to find developing ‘rugby smart’ players as the most rewarding part of what I do. I don’t care much about winning or losing so much as each individual is enjoying him/herself and that they are improving to a level they to which THEY aspire. How long do you intend to coach for? Do you have any other observations that you would share? … I can’t stress enough the benefits of jumping on the athlete-centred band wagon. It sounds almost a no-brainer to say sport should be about the athletes first, but there still is a lot of coach-centred practices where they are largely in it for themselves and not the athletes. At the least, they might have a perception that it’s for the athletes, when it might just be the few (at club level any way) who influence coach to believe that everyone in the team wants to win-win-win. No one’s getting paid for this. Trophies are temporary and there’s no fame from being league champs. The majority of players, I feel, are in it to have fun, experience camaraderie, get fit, etc. with winning being very low on their list of wants. I’m also increasingly siding with those who, in conjunction with the above, are focusing on using the game to teach the game. It’s sometimes called ‘game sense’ or ‘teaching games for understanding’ (TGfU), where the coach questions more than tells and small-sided games dominate as coaching methods. I design active sessions that favour skill activities / games over drills the challenge of each element is such that it’s not too easy but not too difficult, so athletes get genuine opportunities to learn. I tell players to embrace failure, not fear it, and I’m very positive and constructive with my feedback (often having the players give more than I do!). I don’t waste time with a lot of standing around or ‘fitness’ but keep them moving throughout training, presenting opportunities for them to use their brain and develop individual and team skills. In Canada, I feel too many coaches rely on drills that don’t have enough game-like context or do the latest and greatest drill that international players do (like crocodile rolls, without addressing the team’s decison-making at the tackle contest). I favour what I’ve heard is a Kiwi mentality – to become familiar with and proficient at essential skills and knowledge first, and fine-tune the little technical things the higher you progress, if at all. I feel one can be a craftsman with just a few effective and easy-to-use tools; there’s no need to over-complicate a project with ones you rarely use and are too specified for general, more frequent use.